1) Replace the main HUD file with one custom made for the mod, which unfortunately deletes any HUD effects added by another mod. 2) Ask the user to manually modify the menu xml, which a lot of users are uncomfortable doing. The aim of this mod is to automatically build a menu HUD file that includes ALL the elements of your favourite mods, without the hassle of manually editing xml files. This is currently working with the mods I happen to use right now. Obviously there will be a lot more that people will need so post in the comment section with links to HUD mods you would like to see supported by this utility. ALL. The main menu HUD is not replaced, but rather a single include added to whatever UI you use. 1. Advanced Recon Thermal Nightvision. 2. Advanced Recon Range Finder. 4. IMCN - Imps More Complex Needs. 9. FWE - Overhaul Kit_Iron Sight BETA v2_2. 10. Darns support for FWE 6-02. 15. Directors Chair - Total Visual Control Device. Pretty much everything. Please contact me if you find something you suspect is conflicting. But please do not ask me before hand. Try it and tell me. 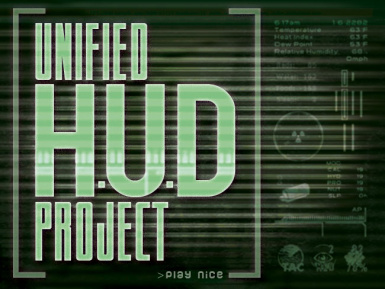 The Unified HUD Project fomod is a scripted installation process that adds a single (includes_HUDMainMenu.xml) file containing a list of all the HUD includes for all unified mods. As long as you deactivate, and then activate the Unified HUD Project after you install or uninstall a new mod, it will keep all your HUD elements working together. I have a few mods with HUD elements, and it is one of the more common requests that I make them compatible with other popular mods. It is also one of the areas most often causing problem for people new to modding their games, and so I felt it was something that might be useful. NONE. None of the user chosen mods, and none of the automatically handled mods. Well obviously you need any mods you attempt to unify. You should install this mod using the Fall Out Mod Manager (FOMM) or the Nexus Mod Manager (NMM). Thanks to MGE we have a banner that can be used by any supported mod.